The query optimizer (called simply the optimizer) is built-in database software that determines the most efficient method for a SQL statement to access requested data. The optimizer contains three components: the transformer, estimator, and plan generator. The optimizer performs different operations depending on how it is invoked. In Oracle Database, adaptive query optimization enables the optimizer to make run-time adjustments to execution plans and discover additional information that can lead to better statistics. Approximate query processing is a set of optimization techniques that speed analytic queries by calculating results within an acceptable range of error. SQL plan management enables the optimizer to automatically manage execution plans, ensuring that the database uses only known or verified plans. The Expression Statistics Store (ESS) is a repository maintained by the optimizer to store statistics about expression evaluation. The optimizer attempts to generate the most optimal execution plan for a SQL statement. An execution plan describes a recommended method of execution for a SQL statement. The optimizer choose the plan with the lowest cost among all considered candidate plans. The optimizer uses available statistics to calculate cost. For a specific query in a given environment, the cost computation accounts for factors of query execution such as I/O, CPU, and communication. For example, a query might request information about employees who are managers. If the optimizer statistics indicate that 80% of employees are managers, then the optimizer may decide that a full table scan is most efficient. However, if statistics indicate that very few employees are managers, then reading an index followed by a table access by rowid may be more efficient than a full table scan. Because the database has many internal statistics and tools at its disposal, the optimizer is usually in a better position than the user to determine the optimal method of statement execution. For this reason, all SQL statements use the optimizer. SQL is a nonprocedural language, so the optimizer is free to merge, reorganize, and process in any order. The database optimizes each SQL statement based on statistics collected about the accessed data. 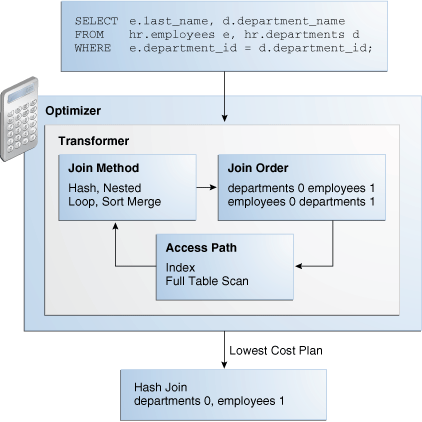 The optimizer determines the optimal plan for a SQL statement by examining multiple access methods, such as full table scan or index scans, different join methods such as nested loops and hash joins, different join orders, and possible transformations. For a given query and environment, the optimizer assigns a relative numerical cost to each step of a possible plan, and then factors these values together to generate an overall cost estimate for the plan. After calculating the costs of alternative plans, the optimizer chooses the plan with the lowest cost estimate. For this reason, the optimizer is sometimes called the cost-based optimizer (CBO) to contrast it with the legacy rule-based optimizer (RBO). The optimizer may not make the same decisions from one version of Oracle Database to the next. In recent versions, the optimizer might make different decision because better information is available and more optimizer transformations are possible. The plan shows the combination of the steps Oracle Database uses to execute a SQL statement. Each step either retrieves rows of data physically from the database or prepares them for the user issuing the statement. An execution plan displays the cost of the entire plan, indicated on line 0, and each separate operation. The cost is an internal unit that the execution plan only displays to allow for plan comparisons. Thus, you cannot tune or change the cost value. 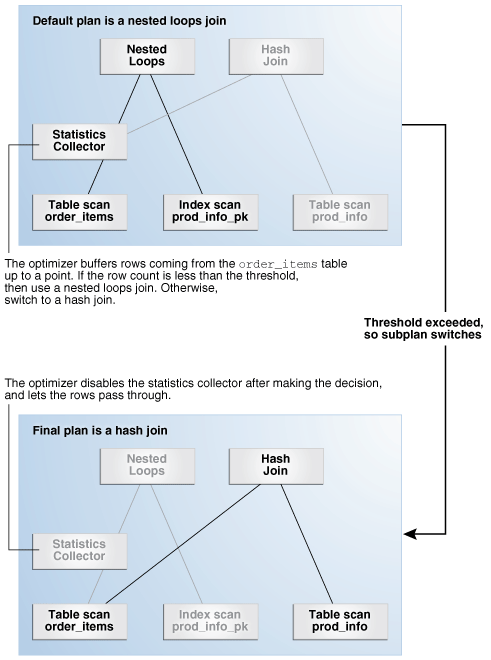 In the following graphic, the optimizer generates two possible execution plans for an input SQL statement, uses statistics to estimate their costs, compares their costs, and then chooses the plan with the lowest cost. Description of "Figure 4-1 Execution Plans"
The input to the optimizer is a parsed representation of a SQL statement. For each query block, the optimizer generates a query subplan. One analogy for the optimizer is an online trip advisor. Each SELECT block in the original SQL statement is represented internally by a query block. A query block can be a top-level statement, subquery, or unmerged view. The following SQL statement consists of two query blocks. The subquery in parentheses is the inner query block. The outer query block, which is the rest of the SQL statement, retrieves names of employees in the departments whose IDs were supplied by the subquery. The query form determines how query blocks are interrelated. The database optimizes query blocks separately from the bottom up. Thus, the database optimizes the innermost query block first and generates a subplan for it, and then generates the outer query block representing the entire query. The number of possible plans for a query block is proportional to the number of objects in the FROM clause. This number rises exponentially with the number of objects. For example, the possible plans for a join of five tables are significantly higher than the possible plans for a join of two tables. A cyclist wants to know the most efficient bicycle route from point A to point B. A query is like the directive "I need the most efficient route from point A to point B" or "I need the most efficient route from point A to point B by way of point C." The trip advisor uses an internal algorithm, which relies on factors such as speed and difficulty, to determine the most efficient route. The cyclist can influence the trip advisor's decision by using directives such as "I want to arrive as fast as possible" or "I want the easiest ride possible." In this analogy, an execution plan is a possible route generated by the trip advisor. Internally, the advisor may divide the overall route into several subroutes (subplans), and calculate the efficiency for each subroute separately. For example, the trip advisor may estimate one subroute at 15 minutes with medium difficulty, an alternative subroute at 22 minutes with minimal difficulty, and so on. The advisor picks the most efficient (lowest cost) overall route based on user-specified goals and the available statistics about roads and traffic conditions. The more accurate the statistics, the better the advice. For example, if the advisor is not frequently notified of traffic jams, road closures, and poor road conditions, then the recommended route may turn out to be inefficient (high cost). The following graphic illustrates the components. Description of "Figure 4-2 Optimizer Components"
A set of query blocks represents a parsed query, which is the input to the optimizer. The following table describes the optimizer operations. The optimizer determines whether it is helpful to change the form of the query so that the optimizer can generate a better execution plan. 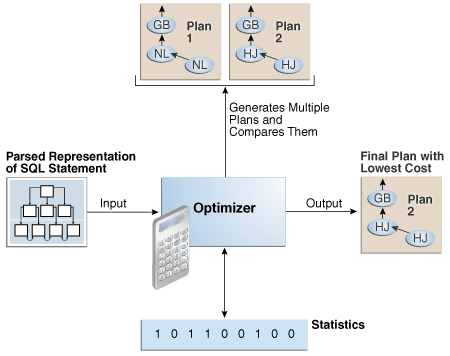 The optimizer estimates the cost of each plan based on statistics in the data dictionary. The optimizer compares the costs of plans and chooses the lowest-cost plan, known as the execution plan, to pass to the row source generator. For some statements, the query transformer determines whether it is advantageous to rewrite the original SQL statement into a semantically equivalent SQL statement with a lower cost. The estimator is the component of the optimizer that determines the overall cost of a given execution plan. The plan generator explores various plans for a query block by trying out different access paths, join methods, and join orders. When a viable alternative exists, the database calculates the cost of the alternatives separately and chooses the lowest-cost alternative. 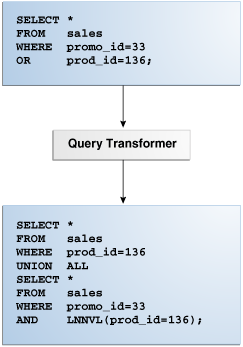 The following graphic shows the query transformer rewriting an input query that uses OR into an output query that uses UNION ALL. Description of "Figure 4-3 Query Transformer"
The percentage of rows in the row set that the query selects, with 0 meaning no rows and 1 meaning all rows. Selectivity is tied to a query predicate, such as WHERE last_name LIKE 'A%', or a combination of predicates. A predicate becomes more selective as the selectivity value approaches 0 and less selective (or more unselective) as the value approaches 1. Selectivity is an internal calculation that is not visible in the execution plans. The cardinality is the number of rows returned by each operation in an execution plan. This input, which is crucial to obtaining an optimal plan, is common to all cost functions. 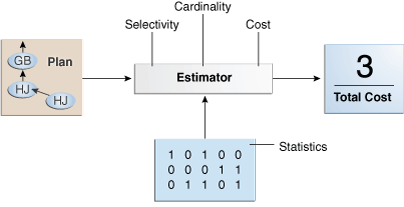 The estimator can derive cardinality from the table statistics collected by DBMS_STATS, or derive it after accounting for effects from predicates (filter, join, and so on), DISTINCT or GROUP BY operations, and so on. The Rows column in an execution plan shows the estimated cardinality. As shown in the following graphic, if statistics are available, then the estimator uses them to compute the measures. The statistics improve the degree of accuracy of the measures. Description of "Figure 4-4 Estimator"
The selectivity represents a fraction of rows from a row set. The cardinality is the number of rows returned by each operation in an execution plan. The optimizer cost model accounts for the machine resources that a query is predicted to use. The row set can be a base table, a view, or the result of a join. The selectivity is tied to a query predicate, such as last_name = 'Smith', or a combination of predicates, such as last_name = 'Smith' AND job_id = 'SH_CLERK'. Selectivity is an internal calculation that is not visible in execution plans. Depending on the value of the OPTIMIZER_DYNAMIC_SAMPLING initialization parameter, the optimizer either uses dynamic statistics or an internal default value. The database uses different internal defaults depending on the predicate type. For example, the internal default for an equality predicate (last_name = 'Smith') is lower than for a range predicate (last_name > 'Smith') because an equality predicate is expected to return a smaller fraction of rows. If a histogram exists on the last_name column, then the estimator uses the histogram instead of the number of distinct values. The histogram captures the distribution of different values in a column, so it yields better selectivity estimates, especially for columns that have data skew. For example, if the optimizer estimate for the number of rows returned by a full table scan is 100, then the cardinality estimate for this operation is 100. The cardinality estimate appears in the Rows column of the execution plan. The optimizer determines the cardinality for each operation based on a complex set of formulas that use both table and column level statistics, or dynamic statistics, as input. The optimizer uses one of the simplest formulas when a single equality predicate appears in a single-table query, with no histogram. In this case, the optimizer assumes a uniform distribution and calculates the cardinality for the query by dividing the total number of rows in the table by the number of distinct values in the column used in the WHERE clause predicate. The employees table contains 107 rows. The current database statistics indicate that the number of distinct values in the salary column is 58. Therefore, the optimizer estimates the cardinality of the result set as 2, using the formula 107/58=1.84. Cardinality estimates must be as accurate as possible because they influence all aspects of the execution plan. Cardinality is important when the optimizer determines the cost of a join. For example, in a nested loops join of the employees and departments tables, the number of rows in employees determines how often the database must probe the departments table. Cardinality is also important for determining the cost of sorts. The cost is an internal measure that the optimizer uses to compare different plans for the same query. You cannot tune or change cost. A executes faster than B. A executes slower than B. A executes in the same amount of time as B. Therefore, you cannot compare the costs of different queries with one another. Also, you cannot compare the costs of semantically equivalent queries that use different optimizer modes. Many plans are possible because of the various combinations that the database can use to produce the same result. The optimizer picks the plan with the lowest cost. The following graphic shows the optimizer testing different plans for an input query. Description of "Figure 4-5 Plan Generator"
The optimizer then tries a different join order, using employees as the outer table. This join order costs more than the previous join order, so it is abandoned. The optimizer uses an internal cutoff to reduce the number of plans it tries when finding the lowest-cost plan. The cutoff is based on the cost of the current best plan. If the current best cost is large, then the optimizer explores alternative plans to find a lower cost plan. If the current best cost is small, then the optimizer ends the search swiftly because further cost improvement is not significant. The optimizer compiles the SQL and generates an execution plan. The normal mode generates a reasonable plan for most SQL statements. Under normal mode, the optimizer operates with strict time constraints, usually a fraction of a second, during which it must find an optimal plan. When SQL Tuning Advisor invokes the optimizer, the optimizer is known as Automatic Tuning Optimizer. In this case, the optimizer performs additional analysis to further improve the plan produced in normal mode. The optimizer output is not an execution plan, but a series of actions, along with their rationale and expected benefit for producing a significantly better plan. Adaptive optimization is helpful when existing statistics are not sufficient to generate an optimal plan. The following graphic shows the feature set for adaptive query optimization. Description of "Figure 4-6 Adaptive Query Optimization"
An adaptive query plan enables the optimizer to make a plan decision for a statement during execution. The optimizer can use adaptive statistics when query predicates are too complex to rely on base table statistics alone. By default, adaptive statistics are disabled (OPTIMIZER_ADAPTIVE_STATISTICS is false). Adaptive query plans enable the optimizer to fix some classes of problems at run time. Adaptive plans are enabled by default. An adaptive query plan contains multiple predetermined subplans, and an optimizer statistics collector. Based on the statistics collected during execution, the dynamic plan coordinator chooses the best plan at run time. The ability of the optimizer to adapt a plan, based on statistics obtained during execution, can greatly improve query performance. For the first execution of a statement, the optimizer uses the default plan, and then stores an adaptive plan. The database uses the adaptive plan for subsequent executions unless specific conditions are met. Adaptive query plans are enabled by default. 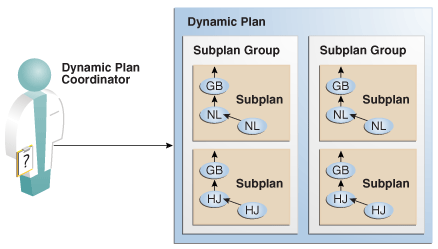 To change plans at runtime, adaptive query plans use a dynamic plan, which is represented as a set of subplan groups. A subplan group is a set of subplans. A subplan is a portion of a plan that the optimizer can switch to as an alternative at run time. For example, a nested loops join could switch to a hash join during execution. The optimizer decides which subplan to use at run time. When notified of a new statistic value relevant to a subplan group, the coordinator dispatches it to the handler function for this subgroup. Description of "Figure 4-7 Dynamic Plan Coordinator"
An optimizer statistics collector is a row source inserted into a plan at key points to collect run-time statistics relating to cardinality and histograms. These statistics help the optimizer make a final decision between multiple subplans. The collector also supports optional buffering up to an internal threshold. For parallel buffering statistics collectors, each parallel execution server collects the statistics, which the parallel query coordinator aggregates and then sends to the clients. In this context, a client is a consumer of the collected statistics, such as a dynamic plan. Each client specifies a callback function to be executed on each parallel server or on the query coordinator. Adaptive query plans are useful because the optimizer occasionally picks a suboptimal default plan because of a cardinality misestimate. The ability of the optimizer to pick the best plan at run time based on actual execution statistics results in a more optimal final plan. After choosing the final plan, the optimizer uses it for subsequent executions, thus ensuring that the suboptimal plan is not reused. The database begins executing the statement using the default plan. The statistics collector gathers information about the in-progress execution, and buffers some rows received by the subplan. For parallel buffering statistics collectors, each slave process collects the statistics, which the query coordinator aggregates before sending to the clients. Based on the statistics gathered by the collector, the optimizer chooses a subplan. The dynamic plan coordinator decides which subplan to use at runtime for all such subplan groups. When notified of a new statistic value relevant to a subplan group, the coordinator dispatches it to the handler function for this subgroup. The collector stops collecting statistics and buffering rows, permitting rows to pass through instead. The database stores the adaptive plan in the child cursor, so that the next execution of the statement can use it. The current plan ages out of the shared pool. A different optimizer feature (for example, adaptive cursor sharing or statistics feedback) invalidates the current plan. This example shows how the optimizer can choose a different plan based on information collected at runtime. Typically, parallel execution requires data redistribution to perform operations such as parallel sorts, aggregations, and joins. Adaptive plans prune indexes that do not significantly reduce the number of matched rows. The following query shows a join of the order_items and prod_info tables. A nested loops join is preferable if the database can avoid scanning a significant portion of prod_info because its rows are filtered by the join predicate. If few rows are filtered, however, then scanning the right table in a hash join is preferable. The following graphic shows the adaptive process. For the query in the preceding example, the adaptive portion of the default plan contains two subplans, each of which uses a different join method. The optimizer automatically determines when each join method is optimal, depending on the cardinality of the left side of the join. The statistics collector buffers enough rows coming from the order_items table to determine which join method to use. If the row count is below the threshold determined by the optimizer, then the optimizer chooses the nested loops join; otherwise, the optimizer chooses the hash join. In this case, the row count coming from the order_items table is above the threshold, so the optimizer chooses a hash join for the final plan, and disables buffering. Description of "Figure 4-8 Adaptive Join Methods"
The Note section of the execution plan indicates whether the plan is adaptive, and which rows in the plan are inactive. Oracle Database can use many different data distributions methods. The database chooses the method based on the number of rows to be distributed and the number of parallel server processes in the operation. Many parallel server processes distribute few rows. The database may choose the broadcast distribution method. In this case, each parallel server process receives each row in the result set. Few parallel server processes distribute many rows. If a data skew is encountered during the data redistribution, then it could adversely affect the performance of the statement. The database is more likely to pick a hash distribution to ensure that each parallel server process receives an equal number of rows. The hybrid hash distribution technique is an adaptive parallel data distribution that does not decide the final data distribution method until execution time. The optimizer inserts statistic collectors in front of the parallel server processes on the producer side of the operation. If the number of rows is less than a threshold, defined as twice the degree of parallelism (DOP), then the data distribution method switches from hash to broadcast. Otherwise, the distribution method is a hash. The following graphic depicts a hybrid hash join between the departments and employees tables, with a query coordinator directing 8 parallel server processes: P5-P8 are producers, whereas P1-P4 are consumers. Each producer has its own consumer. Description of "Figure 4-9 Adaptive Query with DOP of 4"
The database inserts a statistics collector in front of each producer process scanning the departments table. 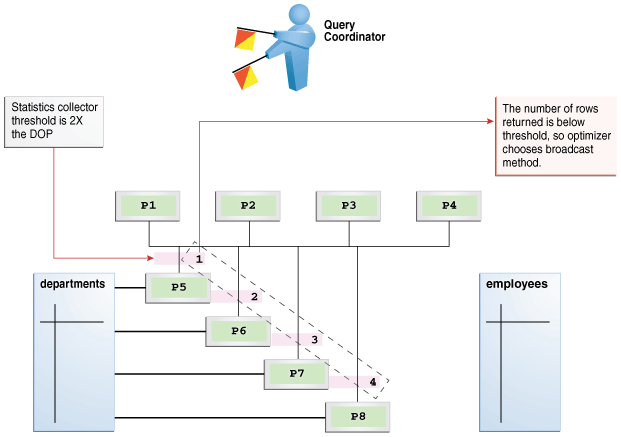 The query coordinator aggregates the collected statistics. The distribution method is based on the run-time statistics. In Figure 4-9, the number of rows is below the threshold (8), which is twice the DOP (4), so the optimizer chooses a broadcast technique for the departments table. When the optimizer generates a star transformation plan, it must choose the right combination of bitmap indexes to reduce the relevant set of rowids as efficiently as possible. If many indexes exist, some indexes might not reduce the rowid set substantially, but nevertheless introduce significant processing cost during query execution. Adaptive plans can solve this problem by not using indexes that degrade performance. The following sample execution plan shows that the query generated no rows for the bitmap node in Step 12 and Step 17. The adaptive optimizer determined that filtering rows by using the CAR_MODEL_IDX and CAR_MAKE_IDX indexes was inefficient. The query did not use the steps in the plan that begin with a dash (-). Dynamic statistics are an optimization technique in which the database executes a recursive SQL statement to scan a small random sample of a table's blocks to estimate predicate cardinalities. In automatic reoptimization, the optimizer changes a plan on subsequent executions after the initial execution. A SQL plan directive is additional information that the optimizer uses to generate a more optimal plan. Adaptive statistics are disabled by default. During SQL compilation, the optimizer decides whether to use dynamic statistics by considering whether available statistics are sufficient to generate an optimal plan. If the available statistics are insufficient, then the optimizer uses dynamic statistics to augment the statistics. To improve the quality of optimizer decisions, the optimizer can use dynamic statistics for table scans, index access, joins, and GROUP BY operations. Adaptive query plans are not feasible for all kinds of plan changes. For example, a query with an inefficient join order might perform suboptimally, but adaptive query plans do not support adapting the join order during execution. At the end of the first execution of a SQL statement, the optimizer uses the information gathered during execution to determine whether automatic reoptimization has a cost benefit. If execution information differs significantly from optimizer estimates, then the optimizer looks for a replacement plan on the next execution. The optimizer uses the information gathered during the previous execution to help determine an alternative plan. The optimizer can reoptimize a query several times, each time gathering additional data and further improving the plan. A form of reoptimization known as statistics feedback (formerly known as cardinality feedback) automatically improves plans for repeated queries that have cardinality misestimates. Another form of reoptimization is performance feedback. This reoptimization helps improve the degree of parallelism automatically chosen for repeated SQL statements when PARALLEL_DEGREE_POLICY is set to ADAPTIVE. During the first execution of a SQL statement, the optimizer generates an execution plan. At the end of the first execution, the optimizer compares its initial cardinality estimates to the actual number of rows returned by each operation in the plan during execution. If estimates differ significantly from actual cardinalities, then the optimizer stores the correct estimates for subsequent use. The optimizer also creates a SQL plan directive so that other SQL statements can benefit from the information obtained during this initial execution. If the query executes again, then the optimizer uses the corrected cardinality estimates instead of its usual estimates. The OPTIMIZER_ADAPTIVE_STATISTICS initialization parameter does not control all features of automatic reoptimization. Specifically, this parameter controls statistics feedback for join cardinality only in the context of automatic reoptimization. For example, setting OPTIMIZER_ADAPTIVE_STATISTICS to FALSE disables statistics feedback for join cardinality misestimates, but it does not disable statistics feedback for single-table cardinality misestimates. This example shows how the database uses statistics feedback to adjust incorrect estimates. Querying the plan in the cursor shows that the estimated rows (E-Rows) is far fewer than the actual rows (A-Rows). The user oe reruns the query in Step 1. Querying the plan in the cursor shows that the optimizer used statistics feedback (shown in the Note) for the second execution, and also chose a different plan. In the preceding output, the estimated number of rows (269) in Step 1 matches the actual number of rows. During the first execution of a SQL statement, when PARALLEL_DEGREE_POLICY is set to ADAPTIVE, the optimizer determines whether to execute the statement in parallel, and if so, which degree of parallelism to use. The optimizer chooses the degree of parallelism based on the estimated performance of the statement. Additional performance monitoring is enabled for all statements. If the two values vary significantly, then the database marks the statement for reparsing, and stores the initial execution statistics as feedback. This feedback helps better compute the degree of parallelism for subsequent executions. If the query executes again, then the optimizer uses the performance statistics gathered during the initial execution to better determine a degree of parallelism for the statement. Even if PARALLEL_DEGREE_POLICY is not set to ADAPTIVE, statistics feedback may influence the degree of parallelism chosen for a statement. The directive is a “note to self” by the optimizer that it is misestimating cardinalities of certain types of predicates, and also a reminder to DBMS_STATS to gather statistics needed to correct the misestimates in the future. For example, during query optimization, when deciding whether the table is a candidate for dynamic statistics, the database queries the statistics repository for directives on a table. If the query joins two tables that have a data skew in their join columns, then a SQL plan directive can direct the optimizer to use dynamic statistics to obtain an accurate cardinality estimate. The optimizer collects SQL plan directives on query expressions rather than at the statement level so that it can apply directives to multiple SQL statements. The optimizer not only corrects itself, but also records information about the mistake, so that the database can continue to correct its estimates even after a query—and any similar query—is flushed from the shared pool. The database automatically creates directives, and stores them in the SYSAUX tablespace. You can alter, save to disk, and transport directives using the PL/SQL package DBMS_SPD. Setting OPTIMIZER_ADAPTIVE_STATISTICS to FALSE preserves statistics feedback for single-table cardinality misestimates. Queries must be able to process data sets that are orders of magnitude larger than in traditional data warehouses. For example, the daily volumes of web logs of a popular website can reach tens or hundreds of terabytes a day. Queries must provide near real-time response. For example, a company requires quick detection and response to credit card fraud. Explorative queries of large data sets must be fast. For example, a user might want to find out a list of departments whose sales have approximately reached a specific threshold. A user would form targeted queries on these departments to find more detailed information, such as the exact sales number, the locations of these departments, and so on. For large data sets, exact aggregation queries consume extensive memory, often spilling to temp space, and can be unacceptably slow. Applications are often more interested in a general pattern than exact results, so customers are willing to sacrifice exactitude for speed. For example, if the goal is to show a bar chart depicting the most popular products, then whether a product sold 1 million units or .999 million units is statistically insignificant. Oracle Database implements its solution through approximate query processing. Typically, the accuracy of the approximate aggregation is over 97% (with 95% confidence), but the processing time is orders of magnitude faster. The database uses less CPU, and avoids writing to temp files. You can implement approximate query processing without changing existing code by using the APPROX_FOR_* initialization parameters. You can set these parameters at the database or session level. The following table describes initialization parameters and SQL functions relevant to approximation techniques. Setting this parameter to false disables all automatic conversion from exact aggregate to approximate aggregate, regardless of the settings of the APPROX_FOR_COUNT_DISTINCT and APPROX_FOR_PERCENTILE parameters. Converts eligible exact percentile functions to their APPROX_PERCENTILE_* counterparts. Returns the approximate number of rows that contain distinct values of an expression. Aggregates the precomputed approximate count distinct synopses to a higher level. Returns the synopses of the APPROX_COUNT_DISTINCT function as a BLOB. The database can persist the returned result to disk for further aggregation. Accepts a percentile value and a sort specification, and returns an approximate interpolated value that falls into that percentile value with respect to the sort specification. This function provides an alternative to the PERCENTILE_CONT function. Accepts a numeric or date-time value, and returns an approximate middle or approximate interpolated value that would be the middle value when the values are sorted. This function provides an alternative to the MEDIAN function. "NDV Algorithms: Adaptive Sampling and HyperLogLog"
The optimizer uses the normal cost-based search method. The ESS resides in the SGA and also persists on disk. The database saves the statistics to disk every 15 minutes, or immediately using the DBMS_STATS.FLUSH_DATABASE_MONITORING_INFO procedure. The ESS statistics are visible in the DBA_EXPRESSION_STATISTICS view.